Overview - Yesterday, today, tomorrow. Past, present, future. Through time and space, one man embarks on a bold 1000-year odyssey to defeat humankind's most indomitable foe: Death. Hugh Jackman plays that man, devoted to one woman (Rachel Weisz) and determined to protect her from forces that threaten her existence. His quest leads him to a Tree of Life...and to an adventure into eternity. Darren Aronofsky (Pi, Requiem for a Dream) directs, continuing his string of imaginative, involving filmmaking with a tale alive with ideas and filled with astonishing vistas. "Not many films can blow your mind and break your heart at the same time, but this one will" (Drew McWeeny, Ain't It Cool News). The behind-the-scenes story of 'The Fountain' is the stuff of Hollywood legend. 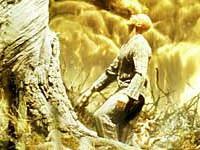 Darren Aronofsky, the genius-in-a-bottle director of the trippy 'Pi' and the disturbing 'Requiem for a Dream,' began work on the film in 1999. After three years of pre-production work, his vision was finally ready to shoot in 2002 with Brad Pitt and Cate Blanchett when the production fell apart because of creative differences between Pitt and Aronofsky. Without a major star, the studio cut the budget and shelved the project -- at that point, it seemed Aronofsky's 'The Fountain' would never make to the screen. But in 2005, Aronofsky walked on water. Out of nowhere, he managed to raise a sensible budget that would allow him to finally shoot 'The Fountain.' The resulting film is an intriguing melting pot of ideas and philosophies that managed to scare away a lot of viewers, but many of those who stick with it have found a deep exploration of love, loss, and a man's unrelenting struggle with mortality. The film bounds between the tales of three men played with fervor by Hugh Jackman: a Spanish conquistador in the 16th century, an oncologist in modern day America, and a dimensional traveler in the distant future. The first tale hovers in fantasy, the second grounds itself in reality, and the third lofts its way into the metaphysical realm of spirituality and the subconscious. The interwoven and nonlinear plot follows the conquistador as he tries to find the immortal Tree of Life mentioned in the Bible. He believes he can save Queen Isabella (Rachel Weisz) from her coming demise if he can provide her a way to live forever. Flash forward to his portrayal of an oncologist desperately working to cure the cancer killing his wife (played by Weisz as well). Finally, in the future, the traveler appears in an energy sphere speeding through space toward a nebula of rebirth. His passenger is the Tree of Life itself with whom he has a mysteriously intimate bond. Sound a bit overwhelming? It certainly can be. Anyone looking for answers won't get them. Anyone hoping for a nice little resolution that will explain everything will be sorely disappointed. Critics bombarded 'The Fountain' with bad reviews, complaining of dry performances and pointless pacing. Audiences walked out of test screenings and gave it poor marks across the board. However, as with many films in the vein of 'The Fountain' (including Aronofsky's own 'Pi'), a small cult following has developed around his latest work and those approaching the film without expectations have found a lot to enjoy. For my own part, I fall into that small group of fans who disagree with most of the criticisms leveled at 'The Fountain.' I thought the performances were heartbreaking, conveying the desperation and hopelessness of something as damning as terminal cancer. Both Jackman and Weisz are so authentic in their individual pains that I couldn't help but be moved on more than once occasion. The pacing is lyrical and intense, pushing the story into territory that's rarely covered in American filmmaking. It's interesting to note that European critics seemed to enjoy 'The Fountain' a lot more than their American counterparts -- I almost feel like our "fast food" mentality has stripped us of the patience required to sink our teeth into a film that requires much thought and introspection. To be fair, I was also a fan of Soderbergh's 'Solaris' and Kubrick's '2001: A Space Odyssey,' two love-em-or-hate-em affairs that a smaller population of film fans gravitate to. Both have a similar tone, initial response, and eventual following that 'The Fountain' is gaining. If you're a fan of either of these two head trippers, you're certainly more likely to enjoy 'The Fountain' -- if you're not, it's probably best to keep this one to a rental, or avoid it altogether. Note that the star rating that I've applied to the movie portion of this review reflects the fact that I know a lot of people will drift to one extreme or the other in their opinion of 'The Fountain.' My three stars is a warning -- approach this flick without expectations and recognize that it's certainly not for everyone. Its inaccessibility to wide audiences is to blame for its poor critical response, but I can almost guarantee that in twenty years, this film that will still be talked about (and will still resonate) in a good number of circles. Presented in 1080p using the VC-1 codec, the HD DVD and Blu-ray editions of 'The Fountain' are identical and look pretty good for the most part. The first thing I noticed was the vivid colors that really give the picture a powerful roundness and dimension. Green forests pop, gold throne rooms shine, and red blood glistens on the screen making for images that look surprisingly lifelike. Fine object detail is nice and background details, print lettering, and textures are all rendered without any problematic fuzziness or shimmer. Some shots are softer, but intentionally so. However, elements like the bark on the Tree of Life, the flaming sword of the Mayan chieftain, and the flecks of snow falling on Weisz's face are all gorgeous. Skintones are warm and ethereal, stubble is rough and worn, and clothing is wrinkled and smudged. 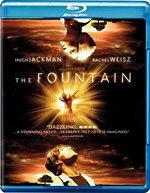 Compared to the standard DVD edition of 'The Fountain,' both high-def editions are visual godsends. There is a moderate amount of film grain, particuarly noticeable in wide expanses of bright colors, but it only adds to the filmic qualities of the picture. The only major distracting issue is the extreme to which the image is drenched in shadows and harsh blacks. Shadow delineation is poor, albeit purposefully so, but it doesn't help the situation much to know it was intentional. Faces are bathed in darkness, detail is lost at times, and too much of the picture requires effort from the eyes. That being said, I was impressed to find that there aren't any major issues with black crush, no instances of artifacting, and no source noise. Torches, fire, and lighting are more vibrant against the blackness and the curse ends up being a slight blessing. Contrast is also good, especially considering how dark the film tends to be, and the image displays a convincing depth of field. At times, the picture is so three dimensional that I caught myself occasionally staring at parts the screen instead of paying attention to the story. However, the video quality sometimes fails to impress as well as it should -- but these moments are the exception rather than the norm. Featuring a Dolby Digital 5.1 surround mix (640kbps), the Blu-ray edition of 'The Fountain' may not be as robust as the Dolby Digital-Plus track on its HD DVD counterpart, but still this standard track holds up very well. The only place where it falters in comparison is with the bass tones of the score (the percussion and heavier string tones on the Blu-ray edition sound more shallow in a side by side test). The dialogue, even when whispered, is crisp and layered well within the rest of the soundscape. Sound effects are earthy and bring a lot of punch to the mix -- it's clear that a lot of attention went into the varying tones between realistic effects and metaphysical sounds. The musical score is also worth mentioning all on its own, as the instrumentation is well prioritized even made the hairs on my neck stand up when the music would swell. Channel movement is subtle and all of the speakers get a good workout throughout the film. The space scenes are so audibly kinetic in the soundfield that they made their way into my notes before anything else. Channel accuracy tends to be a little lax, although I'm not sure if it's intentional or not. Sounds occasionally come from multiple directions even when it's unnecessary, but it often occurs shortly before the disorienting switches between time periods. Overall, the sound mix is quieter and dialogue driven, but never fails to impress when it needs to. First and foremost, the various bits of supplemental material included here can't make up for the one obvious void in the features -- a detailed look at the failed production with Pitt and Blanchett. Perhaps I'm spoiled by the recent candid documentaries and commentaries on 'Payback: The Director's Cut,' but it seems odd that this subject matter is so obviously overlooked. The lack of a director's commentary seems to send the point home and as a result, the supplemental package feels like it doesn't have the same guiding voice or vision as the film. Anyway, rants aside, the first thing I watched was "Death and Rebirth" (64 minutes), a fascinating making-of documentary divided into six sections. The entire documentary is a production diary that covers pre-production, the shooting, the editing, and music composition for the film. Intercuting interviews with cast and crew, this is an engaging, fast paced, and very down-to-earth behind-the-scenes look at the production of a film that almost didn't exist. The cinematography, lighting, effects, score, and research is all covered in depth and I was really impressed by how much effort went into this doc for a less-than-popular release. The only other standard feature is the film's theatrical trailer, available on both the DVD and high-def versions. I can't say it enough -- 'The Fountain' is not for everyone. Some will love it and some will hate it, but backed by such a solid Blu-ray release, its worth a spin if only to see which side of the fence you fall on. 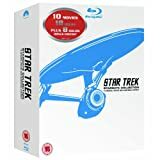 This high definition edition of the film features very good audio and video, as well as some lengthy supplements to sink into. If you haven't seen the film already, it's probably best to use your opinion of 'Solaris' and '2001: A Space Odyssey' to determine how likely you are to enjoy 'The Fountain.' To be sure, this film won't leave you with anything resembling answers, but I found it to be another challenging and noteworthy film from director Darren Aronofsky.